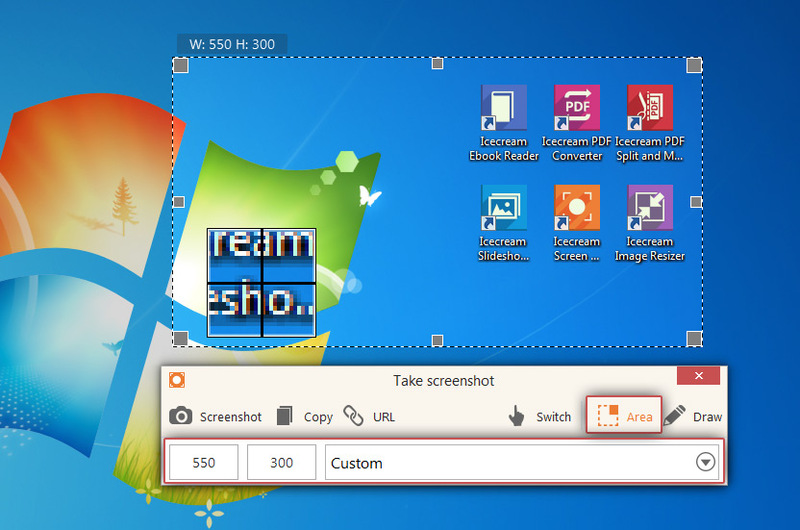 Basically any other computer user is periodically faced with a necessity of taking screenshots, and most people consider it to be an easy task. It is, indeed, but there’s still a better way to do that. 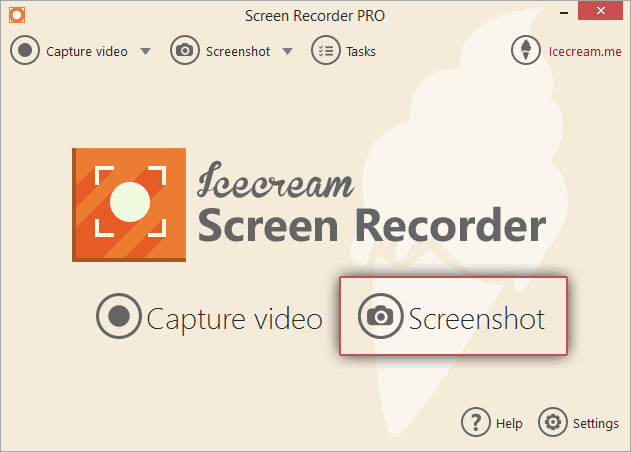 Icecream Screen Recorder will revolutionize your idea of taking screenshots due to a number of useful options. Read the article below to learn how to screenshot on Windows in an easy and effective way. If the program isn’t installed on your computer yet, download Icecream Screen Recorder from this page. Just click the “Download” button on this webpage and save the setup file on your computer. After that, open the file and install the application by following the Installation Wizard’s guidelines. 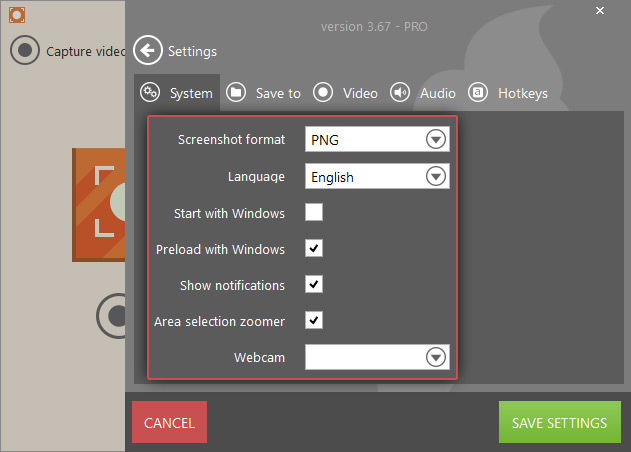 This is all you need to start using the program – now, simply open it and use it to screenshot on your Windows PC. Click the “Settings” button in the bottom right corner to open the Settings panel and configure some settings required for successful screenshots creation. 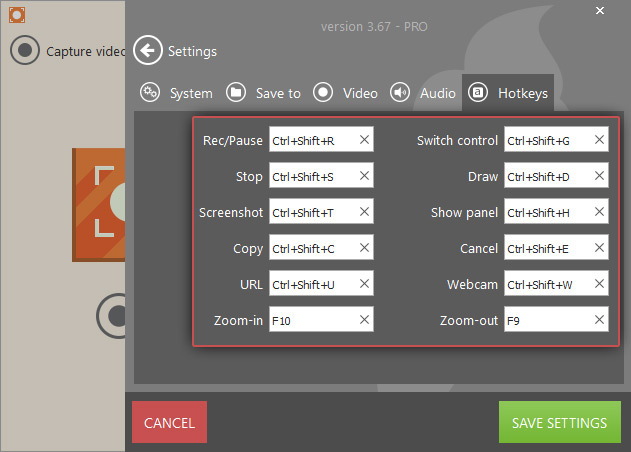 In the “System” tab of the Settings panel of this screen recorder you can select either PNG or JPG format to save your screenshots in (“Screenshot format” option). In the same tab you may turn on and off the notification given to you by the program (“Show notifications”) and the zoomer that is highly a useful tool during the manual screenshot area selection (“Area selection zoomer”). 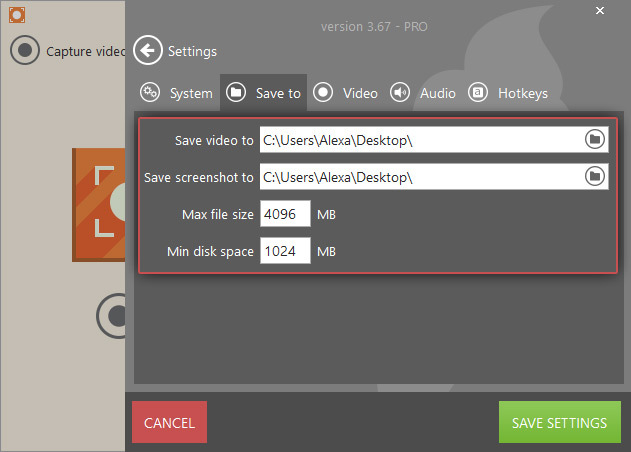 Proceed to the “Save to” tab to choose the destination folder to which your screenshot will be saved to (“Save screenshot to” option). The last but not least, open the “Hotkeys” tab to check the current hotkeys and change their combinations if needed. You may use the hotkeys to create screenshot, copy in to the clipboard, upload it by URL, open the drawing panel and some other actions. To apply the changes made in the Settings panel press the “SAVE SETTINGS” button in the lower right-hand side of the program's window. 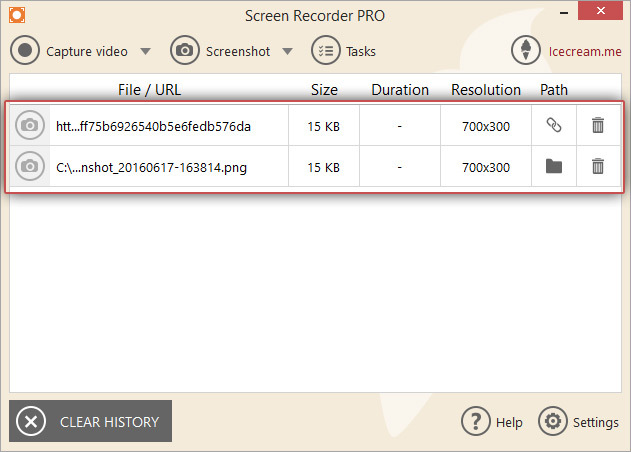 Using Icecream Screen Recorder, you can screenshot any area of your screen. Thus, you don’t have to crop a full screen image later, which means you don’t need to opt for third party image editors. To take a screenshot of a desired area, click the “Screenshot” button in the center of the program's main window. Then, use your mouse to frame a necessary screenshot area. You can select a random area and move the frame manually according to your needs (Custom) or choose one of the available preset profiles (Full screen, 960p, 720p, 1024x768p, 640x480p, 320x240p, or 160x120p) . The “Area” button on the screenshot should be active and highlighted yellow. 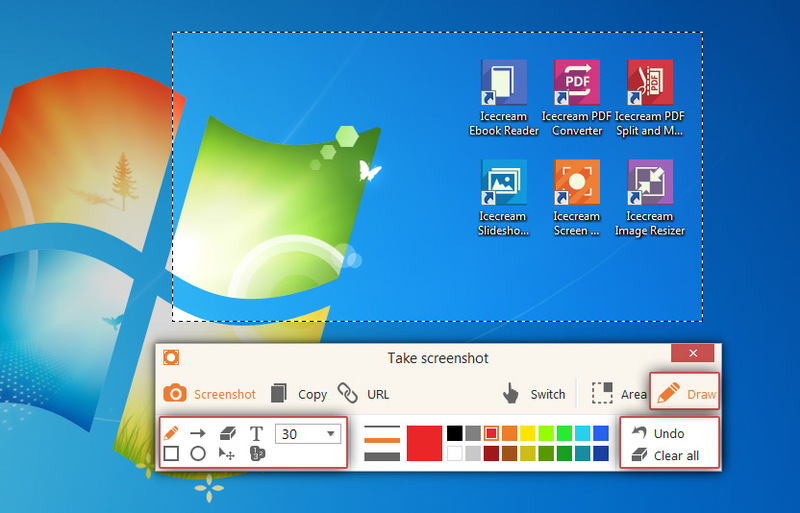 You can use special tools of the screenshot panel to edit your screenshot before its creation. Particularly, you can check the graphic elements available through the drawing panel to point out, underline, frame or comment on your screenshot. To do that, click the “Draw” button in the right-hand side of the panel and choose a drawing tool that you like: brush, oval, rectangle, step tool or arrow. After that, you can choose the desired thickness and color of a selected element and start drawing. If you want to type some text over your screenshot, click the “T” icon, choose font size (8-34) and color, and place the cursor where you want your text to be typed. Add the desired text and proceed forward. To cancel the recent changes, use the “Undo” icon at the right side of the control panel; if you want to erase all the changes at once, press the “Clear all” button. Screenshot. If you want to save a screenshot as an image of PNG or JPG format, just click the “Screenshot” button in the upper left corner of the screenshot panel. Copy. After clicking this button, your screenshot will be saved to clipboard. Now, you can press CTRL+V to paste it wherever you need. URL. By clicking the “URL” button, you transform the screenshot into a link. That’s the best way to go if you want to share your screenshot with other people and don’t want to send it via email, instant messenger or other media. Each link you make will be saved in the program's History panel and you can access any of them from the main window. To delete a link from the program’s history, click the recycle bin icon to the right of each file's title. The “CLEAR HISTORY” button in the bottom left corner will help you remove all the files from the list.